Today is one of those days where I was planning to go to the gym earlier so I didn’t make lunch—but then I ate a bunch of gummy bears and shopped for furniture online and now it’s 1310 and I need to go buy a mattress. Well, now I want food before I go shopping. I am also procrastinating because I hate shopping for anything. I went into my kitchen and spotted a brown, overripe banana. If I hadn’t eaten all my oatmeal, I would make oatmeal with a banana and walnuts. 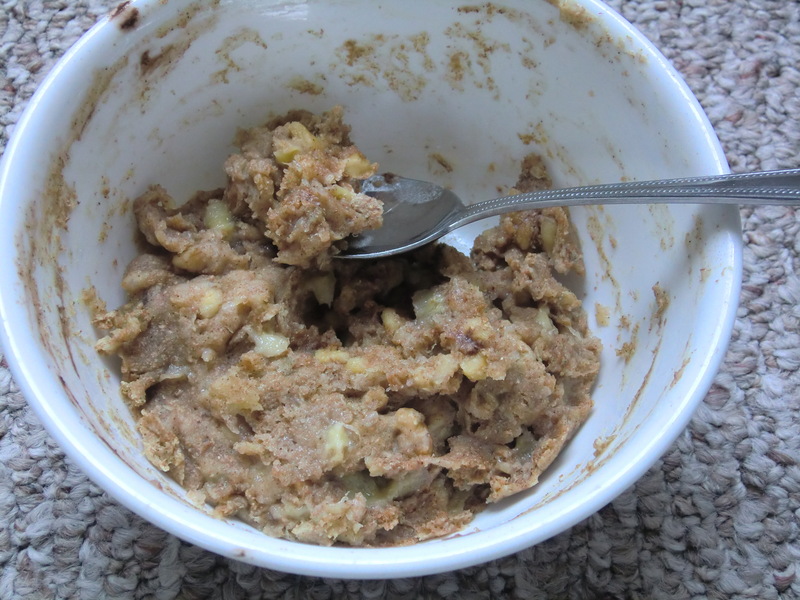 Instead, I decided to make a banana and walnut mash of goodness. But no, wait! How about banana bread?! Banana bread it is. I know everyone’s been posting microwave single-serving desserts for a while now. I think it’s funny everyone “just” discovered that you can make baked things in the microwave. Perhaps they were never up late procrastinating studying for finals. This is a quick, sloppy banana bread recipe for the lazy or those in a hurry. maybe 1/4 tsp baking soda or less. Peel the banana. Put it in the bowl and mash it up. Crumble the walnuts and put them in. Add the dry ingredients. Pour in enough water to make it a little wetter than cookie dough and more viscous than normal banana bread batter. Cook it in the microwave for 2 minutes. It will be sticky at that point, but I like my banana bread sticky, so I went no further. Now it’s time to buy a mattress. It may not look particularly appetizing--but it's a single serving. Nobody's judging your skillz here. P.S. I made carrot cake the next day. Shred the carrots. Mix the dry ingredients. Mix in the water, molasses and honey. 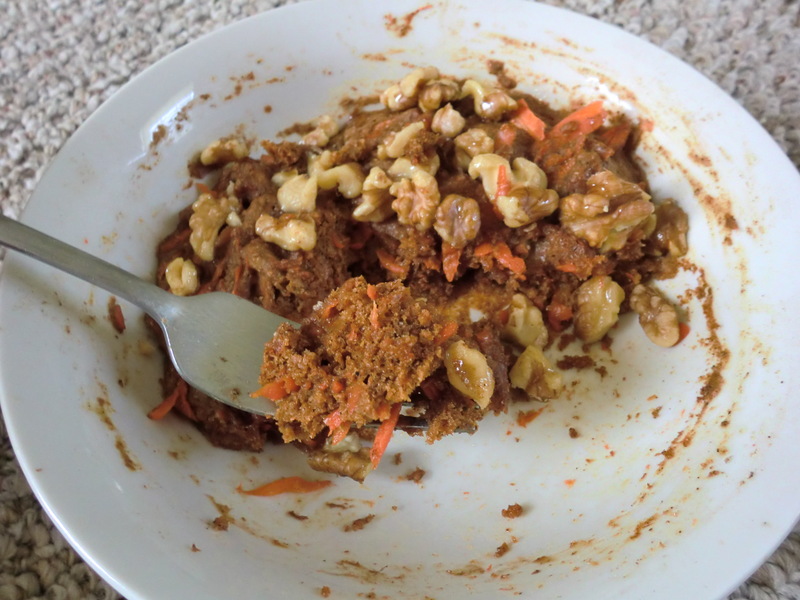 Mix in the carrots and walnuts. Cook for 3 minutes. Consume. I found this recipe a while ago and I decided to make it last night because (1) I had a cup of buttermilk left over and I wanted to use it and (2) we had a Brigade Run today so I brought them for post-run morale noms. Nom nom. Anyway, while I was writing the list of ingredients at work, I realized that she used a BOX CAKE! Oh noes. Inconceivable! But I didn’t have a list of other cakes using buttermilk, so I just looked through some chocolate cake recipes and they all called for freshly-brewed coffee and I don’t have coffee so I found a chocolate cake recipe on Annie’s Eats that I decided to use. Cos she uses espresso powder. So I used that recipe and added in the chili powder and cayenne pepper. Then I went to actually MAKE the cake and realized that, as usual, Annie was using sour cream instead of buttermilk. I don’t know how replacing buttermilk with sour cream changes it, so long story short and 24 cupcakes later, there’s still a cup of buttermilk in my fridge. Now, I also mixed up the baking soda and salt measurements, so they had an extra 1/4 tsp of salt, which I countered with 1.5 tbls flour, which probably made no difference. Anyway, everyone loved them but all the girls said there was too much cocoa powder, so maybe take it down 1/3 a cup. This was the first frosting I made that didn’t come out more like glaze! It was stiff! Hoo-ray. 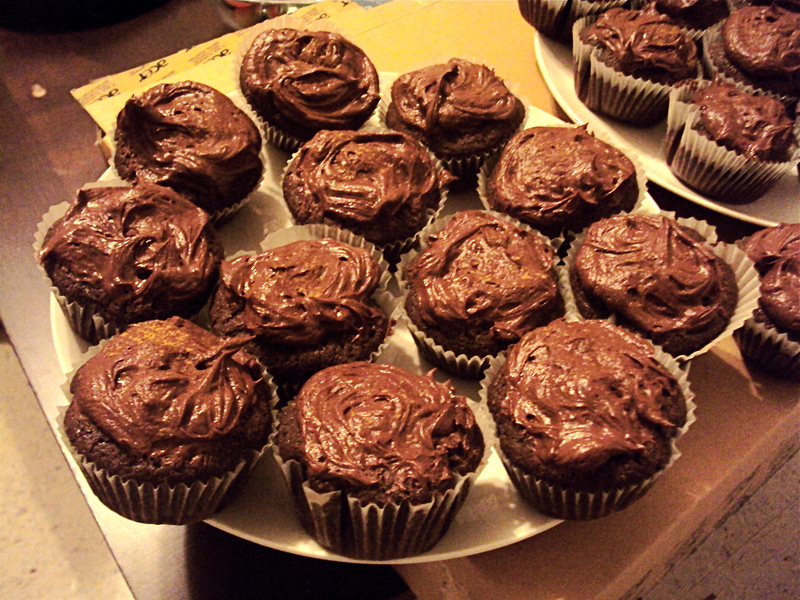 Anyway, it wasn’t a LOT for each cupcake, but I think it’s a good amount just because it’s a lot of chocolate, all around. And by the way, I like to sift my powdered sugar first. I think it mixes better. To make the cupcakes, preheat the oven to 350˚ F. Line two cupcake pans with paper liners (24 total). Combine the cocoa powder and espresso powder in a small bowl. Add the boiling water and whisk until the mixture is smooth. Set aside and let cool to room temperature. Once cool, whisk in the sour cream and vanilla extract. Combine the flour, baking soda, salt, cinnamon, cayenne pepper and chili powder in a small bowl. Stir together with a fork to combine; set aside. Combine the butter and sugar. Beat until light and fluffy, 3-5 minutes. Beat in the eggs 1 at a time, beating well after each addition and scraping down the bowl as needed. Mix in the dry ingredients in three additions, alternately with the cocoa-sour cream mixture, beginning and ending with the dry ingredients. Beat each addition just until incorporated. Divide the batter evenly between the prepared cupcake liners. Bake 18-20 minutes, until a toothpick inserted in the center comes out clean. Let cool in the pan 5-10 minutes, then transfer to a wire rack to cool completely. Beat the butter, cocoa and cinnamon. Gradually add the milk and sugar, alternating to get the right consistency. Beat til it’s fluffy. Frost your cupcakes. I woke up this morning and it was fall outside! When I opened my fridge, I saw a carton of milk I had bought this week to use in the red velvet cake. I bought it at Wal Mart because I was in a hurry, and Wal Mart milk always goes bad. So I figured I should drink some of it before it rots. Before I poured the glass, I thought I’d see what a little cinnamon in milk does. Then I remembered one of my friends asking me if you could make hot chocolate from cocoa powder. I’ve seen recipes before but I’ve never really tried. So I added some cocoa powder to the cinnamon, and a bit of honey and chili powder. I poured in the milk and heated it up and out came hot chocolate! I bet it would be good with a lil cardamom. Put everything but the milk in your mug. Add about 1/3 cup milk to the mug. You can stir it a bit; it probably doesn’t make much difference. Heat it on High for 30 seconds. Sir it vigorously until all the clumps are gone and it looks like thick chocolate milk. Now, if you want hot chocolate, add the rest of the milk and heat it up for another minute. If you want chocolate milk, add the rest of the milk, stir and enjoy! This is my favorite apple pie recipe. I haven’t tried the cheddar crust yet, but hopefully next time I will make it. By the way, if you want to make the crust vegan, use crisco. I tried it with the only vegan margarine I could find (most of them use whey), and it came out…I don’t know how to describe it, but suffice to say the rest of us tried to convince the vegan to eat the “face pies” instead (the ones made with ingredients that came from things with faces, of course). Combine flour and salt. Cut in butter until it’s crumbly. Toss with cold water until it’s doughy enough to roll. Clean your counter, you nasty person. Now flour the surface and put the dough (formed into a ball) on the flour, and dust the top with flour. If you’ve got a rolling pin, flour that and roll out the crust. I used a bowl with a smooth bottom all through college and that worked fine. The palm of your hand will also work. Done? Excellent. Put it in the tin. Add the filling, then pull the extra bits of dough over the top of the filling. Prick some holes in the top of the crust. Beat the egg and brush it over the crust. If you didn’t beat the egg thoroughly, there will be the clumps of the albumen that will like to sink into the recesses of the pie. If you leave them there, they will bake into oddly chewy sections of dough, which I don’t like. Combine flour, salt, and sugar. In a small bowl whisk together the water, egg, and vinegar. Cut butter into dough until large crumbs form. Add egg mixture, stirring as little as possible until the dough starts to form a ball. Form dough into a ball while working it as little as possible. Dough may be somewhat sticky. Place on a piece of plastic wrap and wrap tightly. Chill for at least an hour. Roll or use as normal. 1/4 of ball will make one crust – bottom or top. If baking by itself for a no-bake pie, prick the crust all over – even on the sides – with a fork. This will allow the steam to release instead of it puffing up. Bake in a 350 oven for about 15 minutes, or until the crimped edges are turning golden. Cool compeltely if using a cold filling. Heat oven to 425F. Combine flour & salt; cut in shortening until mixture resembles coarse crumbs. Stir in cheese. Sprinkle with water while mixing lightly with a fork; form into ball. Divide dough in half. Roll one part to 11″ circle on lightly floured surface. Place in 9″ pie plate. Add filling. Roll out remainder of dough to 11″ circle; place over apples. Seal edges of crust & flute. Cut slits in top of pastry. Bake at 425F, 35 minutes. Peel, core, and thinly slice apples. Toss with lemon juice and zest. Mix sugar, flour, and spices. Toss with apples to coat. Roll half of dough into a round and fit into a 9″ pie pan.Fill shell with apple mixture. Dot top with butter. Roll remaining dough into a round large enough to cover top of apples. Place carefully over apple filling and crimp edges of crusts together. Make slits in top crust to vent. Mix teaspoon of sugar with dash of cinnamon. Brush top of crust with milk and sprinkle lightly with cinnamon sugar. Bake at 450 degrees for 10 minutes. Reduce heat to 375 degrees and bake an additional 20-30 minutes. Note: even though you think the crust will burn by leaving it in that long, it shouldn’t. The apples will continue to cook and the crust will be the same as if you’d taken it out when it first turned golden. People always ask me whether I cooked the apples first before putting it in the crust :).